Low Priced, Solid Color Back Snap Adaptive TShirt. Stock up! Full back overlap with two snaps at each shoulder. Quality machine washable polyester cotton. This adaptive clothing for women adaptive tee shirt completely opens up, allowing the individuals arms to be slid into the garment sleeves without ever having to raise/lower their arms or struggle with small neck openings. The back overlap is then folded over and domed/snapped into place. The snap domes are placed on the shoulders to avoid pressure points. 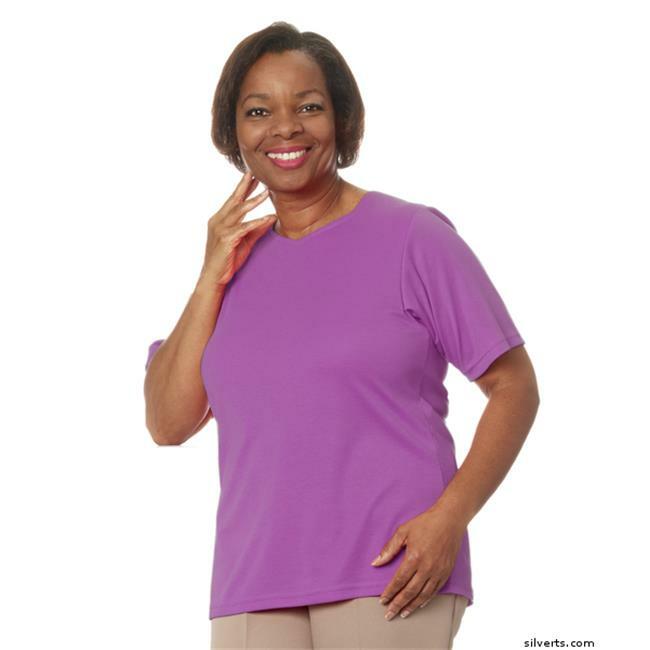 This handicapped clothing for women adaptive t-shirt is terrific for home care and nursing home residents. Silvert’s provides quality adaptive clothing for home, health care, and nursing home residence. Silvert's motto in place, a strong user loyalty was established and maintained. Our design department has incorporated style with the need for ease of dressing. We are aware of the challenges faced by those with decreased levels of mobility, arthritis, scoliosis, podiatry concerns and incontinent issues. Careful consideration and awareness of these concerns keeps us on the leading edge and allows us to provide the best in products and services to our users.